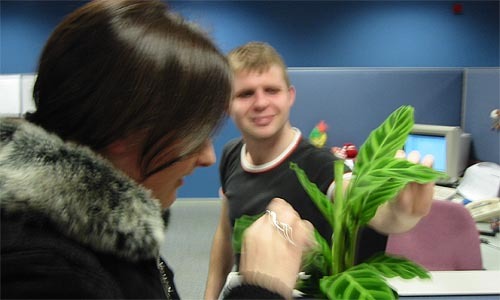 1:Amanda and Des admire Joanne's new plant. "The company should invest in some plants" Joanne says, "the air in here is terrible." 2: Triona and Joanne marvel at the weather. "Marvelling is costing the company hundreds of pounds a day," Waltzer reports, below. Triona: "I like your neck... thing." Joanne: "You like my neck? Really? I grew it myself." Waltzer: "Can I have a go of it?" Someone smoking in the lift lobby of the upper basement was to blame for the premature abandonment of many delicious hot dinners in the canteen on Wednesday. A warning was sent out form the Utilities department the following day stating that "Smoking is strictly forbidden" and that anyone breaking this rule will be "dealt with accordingly." Meanwhile sources close to the Waltzer Experience leaked the news that a fire drill was to happen on Thursday. This led to a lot of confusion among fire wardens on Wednesday and the rest of us on Thursday, as the second fire "drill" was underway. "We haven't had a fire drill for months" one designer said, "And then two come within 24 hours." Another crew member said, "I hope it's only a drill, I haven't collected my personal belongings." There were some happy with the drills however, one writer saying, "It gave me a chance to bump into people I haven't seen for ages." Monday - The Christmas party this year is to take place in Jury's, Ballsbridge. Coaches are to take us to and from the event, which takes place on December 6th. Kicking off at 7.30 with a drinks reception, the party is due to kick into the early hours and ensure that productivity is at an all-year low the following morning. A competition where the winner will win a Kit-Kat mug is underway upstairs in the canteen. To win the mug all you have to do is give your name, address and details to Nestle, the Swiss food company. Have the crew lost their minds? Apparently some people don't mind Nestle building up a database about them! So sign up to a life of junk mail, targeted campaigns, hackers stealing your details and companies selling your details. Well worth it if you are in with a chance to win a mug! The last prize was a computer mouse (in a web company that give you a new mouse if you ask for it). What's next for Kit-Kat? Win a pencil? A Kit-Kat? Maybe even a floppy disc? Woo-hoo, thanks Nestle! Unexpected heavy weather was to blame for the loss of 80 hours of work as 600 crew members gazed out the windows. From the Waltzer Pod on the second floor we could see the torrential rain and snow approaching from the city centre. The freak storm lasted about eight minutes, during which time everyone looked out the window saying "Gosh," "Jainey," and "isn't that mad." While marvelling at the novelty of the weather, others were marvelling at the amount of people looking out the windows. All this marvelling cost the company an estimated �800. A crack-down on marvelling is expected over the next few weeks as top bosses discuss the marvelling problem. That great picture of Sally at the Odessa End of E-Business party, the Irish government's 1950's approach to feminism: Top 10 tips to look after your husband, an interview with Sheharazade about chat-up lines, the future, and what not to discuss in the work place, and in Wrecks Me Buzz, Waltzer warms to the IT House.